So you wanna go out into the real world and get into something, but you need some help in figuring out what’s happening in your surrounding area? There’s an app for that! 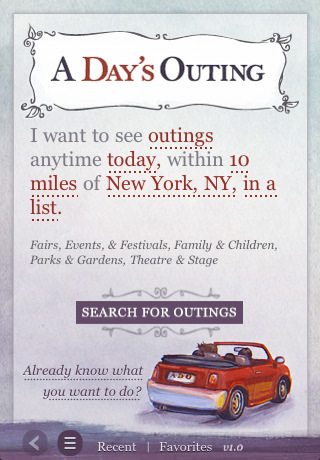 A Day’s Outing is a simple and informative app that lets you pick from a few different types of outings and quickly sniff out the best events that match your taste. You might be thinking, well aren’t there like a ton of other apps that do this exact same thing? Well, there might be, but not all of them have this amazingly fun and creative art direction and user interface. And it’s also hard to find just one app that finds this wide a range of event types, that are all neatly organized for you based on your GPS location. 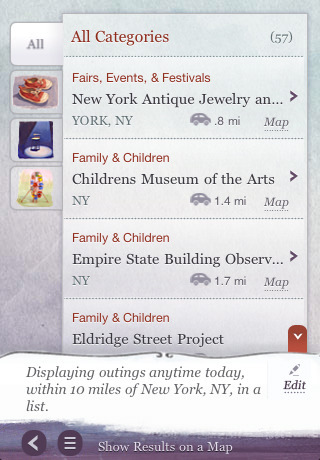 Searching for outings in the app is very stress free. There isn’t actually a search box anywhere to be found. It’s all done with you composing a request using various adjustable phrases to form a sentence. It goes kind of something like this: I want to see _____ anytime _____, within ____ of _____, ____. You fill in the blank by choosing from some options. For example you could do something like: I want to see outings anytime tomorrow, within 10 miles of my location, on a map. Note: If you know the name of the event you can use the old school search box as well. When you get your results – which can be swapped on a map or on a list – tap any one of them to explore more details, get directions, add to your favorites or share via the AddThis plugin. You can call the event organizer, find the exact date and time, and visit the event’s provided website. You can tap to flip through all the search results. You can also always go back to your recent searches, and your favorites. Like I said before, the presentation in this app is by far its strongest suit. I never get tired of looking at the art. The hand drawn cartoon style graphics are a beautiful, the functionality has class, and is all tightly integrated. Almost feels like you’re navigating a postcard or fancy restaurant menu, rather than an iPhone app. I really wish this app would have in addition to all these great events types, night time gigs and concerts, but then again it wouldn’t be called a Day’s Outing anymore. Another killer feature would be to have a social feature where users could talk about and rate the outings. Finally, a random outing picker could be a nice potential feature as well. Overall, this is an app that you would probably keep around for a while, especially if you’re interested int exploring new day time activities in your area. AppSafari review of A Day’s Outing was written by Joe Seifi on September 3rd, 2010 and categorized under App Store, Events, Fun, Local. Page viewed 6177 times, 3 so far today. Need help on using these apps? Please read the Help Page. Thanks for the detailed review of A Day’s Outing. I’m so glad you like what we have created. And…. I appreciate your sharing your thoughts on what we could add into the App next. You seem to be reading our minds!